Sub-Saharan African music is characterized by a “strong rhythmic interest” that exhibits common characteristics in all regions of this vast territory, so that Arthur Morris Jones (1889–1980) has described the many local approaches as constituting one main system. C.K. Ladzekpo also affirms the profound homogeneity of approach. West African rhythmic techniques carried over the Atlantic were fundamental ingredients of Afro-American musical genres such as blues, jazz, reggae and hip hop, and were thereby of immense importance in 20th century popular music. Drums are classed as membranophones and consist of a skin or “drumhead” stretched over the open end of a frame or “shell”. Well known African drums include the Djembe and the Talking drum. Let me use this opportunity to describe to you some of the drums in Ghana. 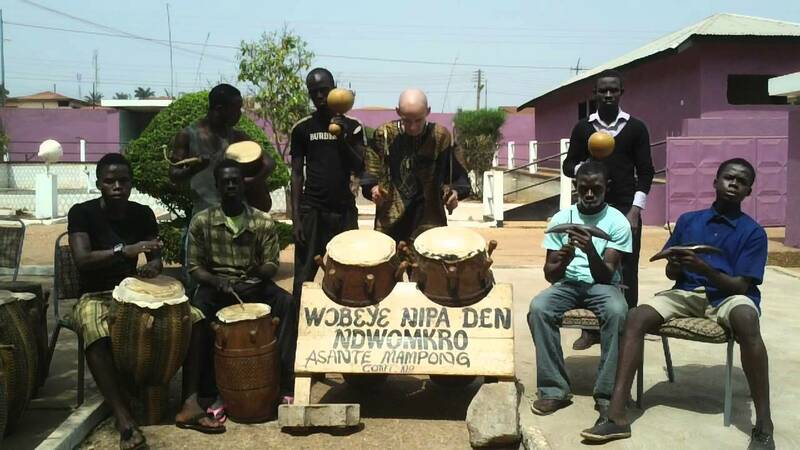 Adowa Drums – Regional drums from the Ashanti Central States of Ghana. The fontomfrom drum family (either in part, or all drums) and others are traditionally played at many community and regional events. There are many, many different drums in Ghana, and the fontomfrom represents well the remarkable, proud cultural and spiritual traditions found there, this is because of it’s imposing size and symbolic appearance, and the musicaliaty of it’s sound. 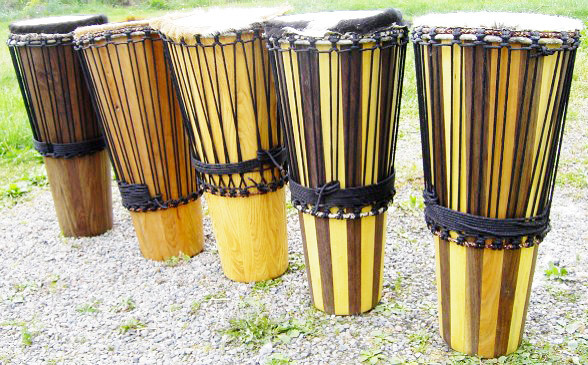 These high-quality drums are carved from Tweneboa wood, a resonant, somewhat plentiful preferred drum making wood in Ghana. The skins are stretched over the tops of the drum shells and fastened with strong pegs that fit snugly in the drum shell. The tall fontomfrom drum has a thunderous sound (the drum sound imitates it’s name) that, played correctly, can be heard from a long distance. Timbre-wise, atumpans are more mid-range and complement the bassy fontomfroms well. Both of these types of drums are headed with a medium to heavy cow skin. The sound of the apentema again imitates it’s name, tonal wise it may compare to some congas and is played with hands or sticks. The apetia is the baby drum—played with two sticks, it is tuned to make a bright repetitive sound. 2. Ashiko – A tapered-cylindrical hand or stick played drum with similar variations used many regions of Africa. There are some based on South-Central Nigeria and Eastern Ghana. 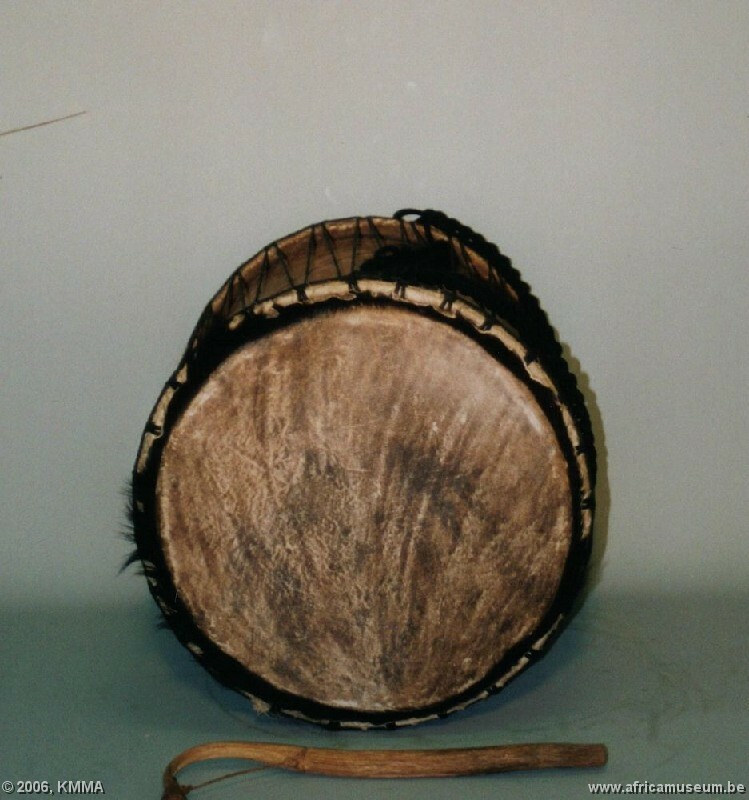 Goat or cow hide is used for fixing the drums. 3. Bongolo – Unique African ceremonial/ritual type drum. The drums are headed with thick cow skin (other choices are possible), has three feet carved into the shell (forming its own built-in rugged drum stand). Has a small sound opening to enhance sub-audio bass. Suitable for Afro-Cuban and world music contexts, could be construed as a cross between a dundun and a conga, and is playable by hands or using sticks or mallets. 4. Brékete/Gungon – This style drum is common to many cultures, this particular type of drum is played in Ghana. For it’s relative size, this drum can make a powerful, thunderous sound. 5. Conga – These Afro-Cuban style drums are hand-caved from a tree trunk in the traditional Cuban conga shape, from single hardwood log in Ghana, Mali, and Ivory Coast. They are fitted with tuning hardware or made with a rope tuning system, and headed with raw African cow skin. The shells are hand polished with an oil mixture and sealed with either polyurethane or bees-wax finish. These drums are very unique, and they sound amazing. 6. Djembe – The Djembe (aka jim-bay) is the most popular African hand drum in the world. It’s populatity blossomed into many different settings in the last twenty years. This is because besides it having a spiritual aspect in it’s sound, a disciplinarly, and community gathering aspect in the learning and playing of it’s traditional music, this drum has a large tonal range for a single, fairly simple made drum, and this lends it’s self well to many different situations. 7. Dondo – Talking drum from Ghana, a variable-pitch drum played with a curved stick by squeezing it under the players arm. 8. ATSIMEVU is a popularly known as the grandfather of all the ewe musical instruments and the tallest of all. It has a carved body of about 4 ½ feet tall and has a drum head of about 9 inches in diameter which is mostly made from animal skin. In order to play the atsimevu, the drummer should stand parallel to the drum which is tilted against a stand known as vudetsi, bringing the height of the drum head below the chest for a good leverage and aiming position. It is played with two sticks or stick and hand.